Kurt, for us, means going back to our roots. Served in cans and in kegs, it’s a Pale Ale made to be drank in big amounts. 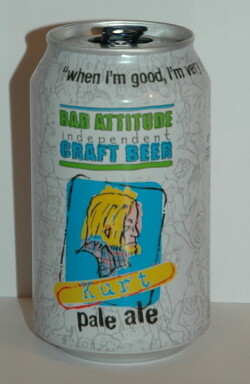 Hoping that Kurt will be the perfect "Gatewat Beer" for those who have only ever drunk industrial lager, we also want it to be appreciated for beer lovers on sunny summer days. Kurt is brewed with Maris Otter malt and hops from the New World (Riwaka e Motueka). We use untreated water for brewing, which makes its unique mineral properties enhance the grassy notes of the hops. Bottle, 330 ml, courtesy of Max. Shared with him and JFK10000. Hazy golden, white head. Hoppy, some citrus notes, orange, moderate bitterness in finish. Light bodied. Pale straw, ridiculously big head is creamy dense, white, stays long and leaves lacing, sparkling lightly. Fresh citrus, tangerine, bit exotic fruit, sweet. Light body, thin and soft feel, standard carbonation, sweet and medium bitter, long finish has grapefruit. Refreshing and easy to drink. Pale golden, frothy white head. Fresh fruity, creamy notes in aroma. Pine and citrus too, something suggests exotic as well. Nice. Citrus with some bitter notes in taste. Juicy lemony notes too. Light bitter finish. Opened with quite a fizz, and was hard to fit in 3 glasses. Cloudy yellow, enormous ice-cream float head. Pleasantly spicy wheaty aroma - orange zestiness. Watery palate, but refreshing. Pleasant wheaty grains in the body, and a lovely spicy lemony and grapefruity hoppy bite. Nice quaffer for summer days as it’s got a real refreshing bite. 330ml can (thanks FatPhil). Hazy pale orange color. Huge size, thick white head, stays. Sweet, citrus, orange, malty, some perfume in aroma. Citrus, slightly soapy, shoe leather in taste. Leathery orange peel in aftertaste. Crisp carbonation. Soft citrusy bitterness. 0.33 l can from local supermarket. Light yellow colour, huge head. Taste is mainly citrus from the hops: Pacific Jade, Pacific Gem, Motueka, Riwaka. Includes Maris Otter Pale Ale malts and wheat malts. Quite refreshing. Aroma is citrusy and little herbal. Flavor is sweet, citrusy, little bitter. Refreshing. A hazy, grassy taste at first. A slight tinge of bitterness, earthy, lemon tones. Very smooth, easy to drink, pleasant pale ale!